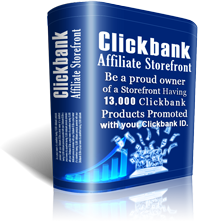 You own customizable and searchable ClickBank Affiliate Storefront! Over 13,000+ products are integrated with your own ClickBank ID. Earn commission as high as 75%! It is pre configured and ready to promote! Be in business from the next minute onwards. The product title and product descriptions we display on your storefronts are redefined for leveraged performance. Please click here to see the difference between them. 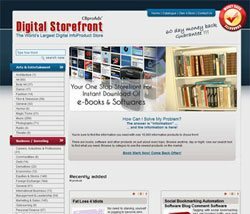 CbproAds.com provides a fully featured CB StoreFront to make money with CB for those who don't have their own website/blog. You will be given your own fully indexed and completely searchable CB Marketplace Website (StoreFront) by us. This is a very promising website for any one those who want to make money with Clickbank in a quicker way. We provide you with your own website, we host your site, and we update your Clickbank MarketPlace on a daily basis. 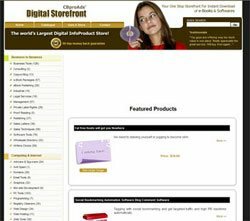 On your ClickbankB StoreFront Website containing 13,000+ products, all product links are integrated and cloaked with your own Clickbank ID in the background and all money goes directly right into your Clickbank account INSTANTLY. 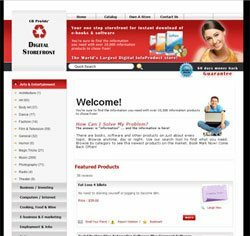 No need of website design or hosting. No need to worry about customer service as it is taken care by the Clickbank. 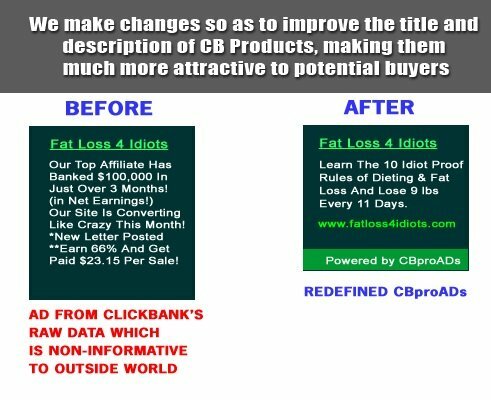 All products are linked with your own Clickbank ID. All links are cloaked for protecting your commissions. Automatically updates with the Clickbank's Marketplace data feed every day. Add your own other affiliate program ads on to it. Visitor Friendly Redefined Titles, Descriptions and Keywords (REDEFINED ADS). No affiliate information in Titles and Descriptions of sites. Embedded with the graphic cover image of all products. User Friendly and Intelligent navigation links. 100% Products listed are along with it's price and popularity rank. Products can be ordered according to popularity or price. Member Area to track visitors & clicks. Clickbank Tracking ID is integrated on to your StoreFront to track the sales.